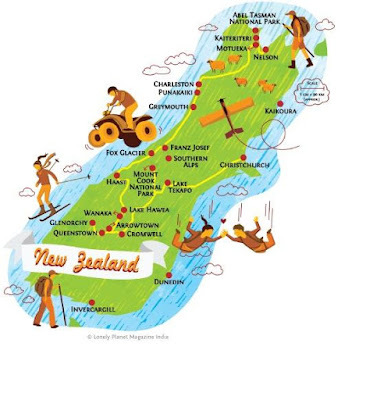 To date, the IFEG (Irish French Expeditionary Group) and AIEG (Anglo Irish Expeditionary Group) have travelled from Akoroa to Dunedin, to Queenstown (with an aforementioned detour) and Wanaka, to Murchison via Fox Glacier (it’s melting v fast), from Golden Bay to Picton from where I am writing. The combined tour comes to an end tomorrow with the IFEG party heading to the North Island and thence to Auckland and onto Malaysia for a few days. The AIEG party are spending a few days in Kaiakoura before ending our tour in Christchurch from where we head back to northern climes. Where to start? As the title suggests, we have been rafting – White Water Rafting to be more specific. Based in Murchison alongside millions of sandflies, Intrepid Tours run rafting trips along many of the rivers in those there parts. We booked a whole day tour with three guides and three boats. Dressed in thermal tops, neoprene wetsuits, neoprene boots, buoyancy jackets and helmets, we must have presented an odd looking group. The only accessible skin was our hands and goodness me did the sandflies make hay, as it were. After a short drive to the Buller River – the longest free flowing river in New Zealand because it has not yet been dammed or have any hydro electric installations on it, we were given a short ‘elf n’ safety’ talk and as the poet Masefield put it, we ‘must down to the sea, the lonely sea and and the sky’ although it was a river and not very lonely. Ah well. We glided and paddled and then came to the first set of rapids. Looking fairly innocuous (oh the bravery of the inexperienced!) it came as a rude shock when Matt, our ‘chap at the back’ shouted “Get down” and cold water washed all over us. Once through that particular rapid I recalled in my mind the conversation I’d had with an insurance company whilst sorting out my travel insurance. When I asked Doug, I think his name was, about ‘dangerous sports’ knowing that WWR (white water rafting) was a possibility he said he’d have a look at the list. “Interesting” he said, “archery is there alongside badminton”. Both our minds boggled and I’m sure conjured up different mental constructs as to how either of them could be termed ‘dangerous’. Mine had me strapped to a target with Robin Hood and his Merrie Men about to let loose a volley of arrows in my direction. I digress but you will be reassured to know that guided WWR up to Level 3 is covered. We mixed up the adrenaline fuelled shooting of rapids (‘Earthquake Falls’ was one such typical name) with gentle meandering down the slow sections of the river much like Ratty and Mole in The Wind in the Willows enjoying a delicious picnic of freshly made sandwiches, fruit and cakes. 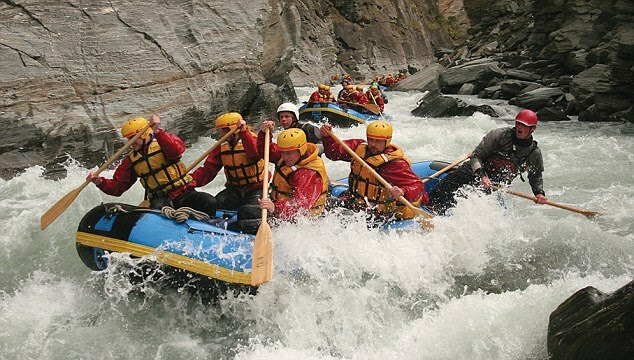 One memorable moment came when Matt decided to ‘surf’ the raft in a rapid. Suffice to say this meant holding the bow of the raft into a fast running flow of white water so much so that the two bow occupants, the aptly named Perrier pere et fils, were subjected to a freezing cold, torrential shower from which emanated gasps of shock and air and the occasional “Mon Dieu!”. 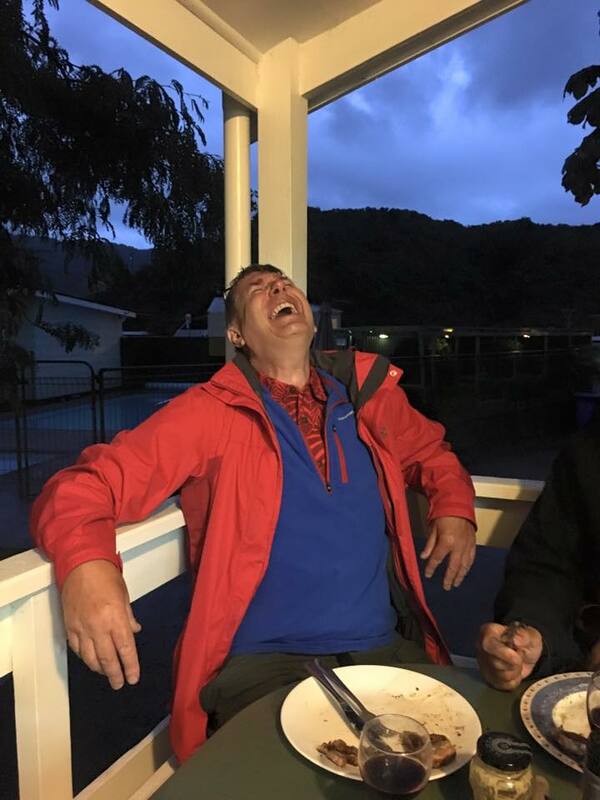 How we laughed – in the back of the raft, dry and full of humour. I cannot end this little tale of the river bank without mentioning something that our chums from Wind in the Willows did not have to contend with: sandflies. We first encountered these critters in Wanaka but the Murchison version has a real attitude problem. Any morsel of bare flesh was fair game to them and the seven hours we spent on the Buller was seven hours of sandfly heaven. They are tiny little bugs and they give a noticeable but not especially painful nip; one spends a great deal of time brushing them off yet they still persist. This hand above had over 30 bites on it. Our physiological reactions ranged from no reaction to pustules forming on the hand in the case of Barbara (otherwise known as 'the Felon'). The poor girl was really very uncomfortable with pustular swollen hands. In a group that contains three doctors, the way they seemed to distance themselves, professionally and physically, from the problem was slightly unnerving. As I write this, the Felon has reminded me to tell of the near drowning. It almost escaped my memory which is a bit surprising because it was your correspondent who nearly drowned. What happened is as follows: along the lazy, slow moving parts of the river, our guides, Matt included, encouraged us to hurl ourselves overboard into the cool waters. On the second occasion, I decided to join in the fun and not terribly elegantly joined Poseidon. Remember that we were all dressed head to toe in warm, buoyant clothing so the danger of getting into difficulty was remote, to say the least. After a few moments of floating Eeyore like, I felt a rising sense of panic and very quietly said “I’m panicking” to anyone that might have been within earshot. No reaction so I grabbed a leg belonging to Edouard Perrier and said to him “Teddy, I'm having a bit of a panic here” and understandably given the lack of urgency in my voice, he laughed and carried on floating. Luckily his father heard me as did Matt and soon the rescue was assayed and I lay, panting in the bottom of the raft feeling a tad foolish. It was a horrid moment, I can tell you. And so ended a fabulous day on the Buller – laughs, fear, adrenaline and weary arms and thanks to all the guys at Intrepid tours for joining in the fun and being so totally professional in the way they went about their work. From Murchison, we decided to head north to Golden Bay and the Abel Tasman National Park. 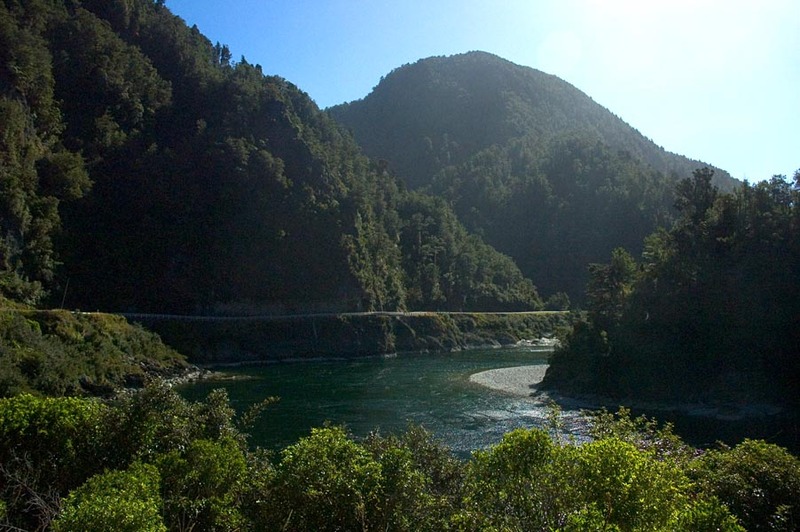 I find it fascinating that the great man has a body of water and a national park named after him but he never set foot in New Zealand. The motorhomes managed to secure accommodation at a campsite but us ‘saloonies’ had ‘no room in the inn’. Tina found, via AirBNB, a glamping site for the Felon and myself. After our experience of tents in Akoroa, the enthusiasm was muted. Yet what an experience we had. Owned by Shanti a young Coloradian who has lived in NZ for the last 15 years, the huge bell tent (5m diameter) was sited on her ½ acre property amongst fruit trees, her vegetables, chickens and a pet rabbit. Nearby was a composting loo and a babbling stream – not , I repeat not, connected. Inside the Achillean tent was a queen sized sleigh bed, chairs, chest of drawers, lights, tea and coffee making facilities as per the best hotels. All fully electrified. In her garden shanti had made an outdoor cooking area for her guests consisting of a two ring gas burner and a sink with a rain water fed tap. It was a wonderful two nights that we spent there – hearing the dawn chorus from the warmth of the bed and then after they had exhausted their repertoire, going back to sleep for another fours hours until the sun awakened us. Thank you Tina for finding this adventure for us – no holiday is complete without a spot of glamping. Finally – to flip or not to flip, that is the question. Over the many evenings when we have enjoyed BBQ’d food, it has become apparent that there are deeply held views as to the correct way of cooking. Are you a flipper or a sealer/releaser? When you add males to the conundrum, the views seem to be more entrenched. Some, perhaps two men, watching a third man cook are astounded at the speed with which the spatula is used to flip the meat. It transpires that these two are ‘Sealer/releasers” whose credo is to Leave the Meat Well Alone. Their ‘copain de feu’ is a Flipper and as soon as the meat is on the grill, he’s working away with the spatula, turning and flipping much to their incredulity at the heretical act they are witnessing. I’m sure that being the discerning reader you are, you will have your own views. Random but cool. 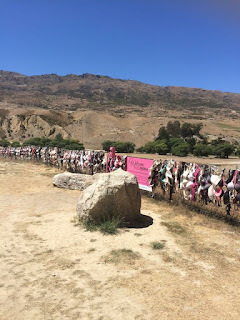 Fence of bras in support of the big C.
A postscript: no wars were declared or diplomatic incidents recorded in the cooking of consistently delicious food over the past three weeks. More dreams come true...sort of. Invercargill – a childhood dream.